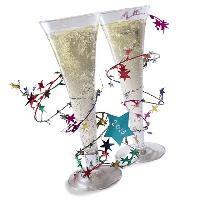 Celebrate New Years Eve in style, then here are these ways to crystallize the moment . A fun family activity to count down to the New Year. Simply fill your bags with ideas to do every hour leading up to the big event. At the designated hour, have your child open up the bag to reveal the task inside. Some bag filler ideas.treats, disposable cameras, a new movie to watch, craft kits, noisemakers and confetti, etc. 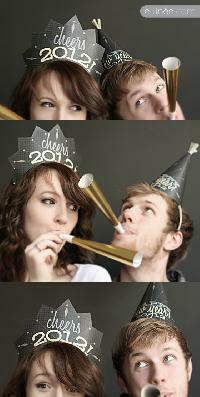 Ring in the New Year with style wearing these fun and FREE printable new years party hats. They are super easy to make and are sure to be a hit at your New Years bash. Do like the Spaniards do and eat grapes at midnight for good luck. 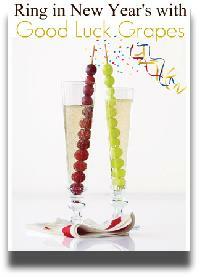 Thread 12 grapes on a skewer for each guest and serve in a tall champagne flute. What could be more festive than a balloon drop.? Make a homemade balloon drop and at midnight pull the string and let the balloons fall. Kids and adults alike will LOVE it. Free printable New Years Eve BINGO game that you can play while you wait for the ball to drop on TV. Ring in the new year with this idea from Family Fun. 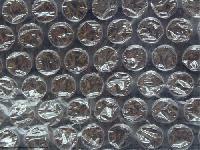 Buy bubble wrap (the large bubbles work best) and spread out on a hard floor just before midnight. At the end of the countdown, stomp. It sounds like firecrackers and is a fun way to start the year. 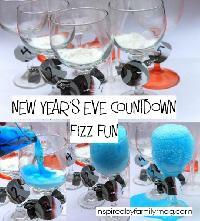 Countdown each hour leading up to midnight with some champagne fizz fun using baking soda and vinegar. Your kids will be amazed. Start a new family tradition. Strip your Christmas tree of all the decorations (except the lights) and dress it all back up again with inexpensive New Years decorations. Super easy EDIBLE countdown clock. 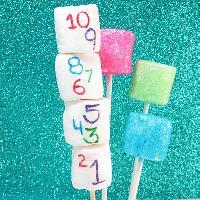 Simply write the countdown on marshmallows with edible pens. Such a cute and tasty idea.